Tunisia is a leading country, worldwide, as far as natural phosphate and mineral fertilizers are concerned. Compagnie des Phosphates de Gafsa (CPG) has been active in mining for more than a century. The activity of ore benefeciation and production of various mineral fertilizers is more than half a century old. CPG operates seven open cast quarries and one underground mine. Annual production of merchant phosphate in 2007 reached 8 millions, placing Tunisia the fifth in the world for phosphate production. After having been exporting all its phosphate rock production during the first fifty years of its activity, Tunisia entered successfully into phosphoric acid and mineral fertilizers production and developed this new activity so that Tunisia is now processing more than 80% of its phosphate production. GCT owns 4 industrial sites located in SFAX and M'DHILLA (for TSP), GABES (for Phosphoric Acid, DAP, DCP and AN) and SKHIRA (for Phosphoric Acid). The phosphatic field holds an important position within the Tunisian economy both in labour level and in trade balance worldwide. The Tunisian phosphate industry is fifth amongst the international operators in the field. Natural phosphate and its by-products (Phosacid, DAP, TSP, DCP...) are exported to 50 countries in 5 continents. In 1994, The Tunisian government merged the chairmanship of CPG and GCT appointing the same chairman. In 1996 the government ordered a single common commercial Direction. The merger brought greater efficiency to the sector. It was in April 1885, while surveying the region of Metlaoui, South Western part of the country, that the French amateur geologist Philippe THOMAS discovered powerful layers of calcium phosphates in the Northern hillside of JEBEL THELJA. This major discovery was followed by extensive geological explorations, which further revealed the existence of intensive phosphate formations south and North of the so-called Kasserine Island. In 1896, the Compagnie des Phosphates et de Chemin de Fer de Gafsa -"The phosphate and railroad company of Gafsa" - was founded announcing the establishment of a national phosphate industry in the country. In the meantime, the first excavations took place in Metlaoui and by 1900; rock production reached a level of 200.000 tons. After these early beginnings, the Compagnie des Phosphates et de Chemin de Fer de Gafsa has gone through several transformations in its structure during the long course of its history, before attaining its current status and becoming the Compagnie des Phosphates de Gafsa - CPG - in January 1976. With over a century of experience in mining, upgrading and marketing Tunisian phosphates, CPG is one of the leading phosphate producers worldwide. 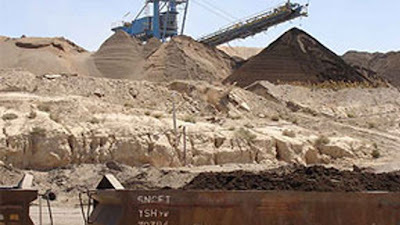 With a current production exceeding 8 million metric tons in 2007, CPG is the world's fifth largest phosphate producer. Discovery of phosphate deposits by Philippe Thomas in the northern hillside of JbelTHELJA near Metlaoui. The Compagnie des Phosphates et de Chemin de Fer de Gafsa was founded and the first excavations were made in Metlaoui. The construction of the railway line between Metlaoui and the port of Sfax started at the same time. Opening of the underground mine of Metaloui. Opening of the underground mines of Kalaâ Khasba (ex-Kalaâ Jarda) and Redeyef. Opening of the underground mine of Moulares. Foundation of the Société Tunisienne d’Exploitation Phosphatière - STEPHOS. Concession of the Moulares mine to the Compagnie des Phosphates et du Chemin de Fer de Gafsa and starting exploitation of the mine of Kalaâ Khasba in El-Kef region. After independance, Tunisia nationalized the different Phosphate Companies. the equity of the Compagnie Tunisienne des Phosphates de Jbel M’Dhilla became entirely Tunisian and the Company took the name of Compagnie des Phosphates de Jbel M’Dhilla - CIPHOS. The concession of the railway line Sfax-Gafsa given to the company by the convention of August 25, 1896, expired. The CIPHOS merged with the Compagnie des Phosphates et du Chemin de Fer de Gafsa. The STEPHOS merged with the Compagnie des Phosphates et de Chemin de Fer de Gafsaand since then, all the companies merged to form the Compagnie des Phosphates de Gafsa - CPG, a corporation which is totally state owned. Unification of the General management for the CPG and the Groupe Chimique Tunisien -GCT. Merger of the commercial departments of CPG and GCT. It is over a 100 years since CPG started the exploitation of phosphate deposits in Tunisia. Currently, the mining operation is principally based around the deposits in the Gafsa basin located in the south of the country, north of Chott el jerid. Today, CPG works ten surface mines in 5 phosphate fields, all situated in the same Eocene geological level. For many years, CPG has been investing methods of reducing production costs while increasing capacity. This has been generally achieved by developing opencast mines to replace underground capacity. Opencast mining methods were recognized as being cheaper to operate. All Tunisian phosphate rock mines are now opencast. The move to open cast mining has brought significant savings in labor costs and increased productivity. Over the last 10-year period, CPG has seen its merchant rock output rise from 6 million metric tons in the late 1980s to more then 8 million tons in 2007. Tunisian phosphate concentrates range in two main categories based upon the content of P2O5; the merchant-grade 65-68% BPL grade mostly used for chemical process, and the merchant-grade 60-62% BPL grade, well suited for direct application. CPG supplies around 80% of its phosphate production to the GCT plants for local processing and the balance is railed to Sfax for export. GAFSA is marketed in more than 20 countries throughout the world either for processing or direct application.